Diana Singing. Magazine.shnsf.com. N.p., n.d. Web. 13 May 2015. .
Motown Records had a great impact on America. 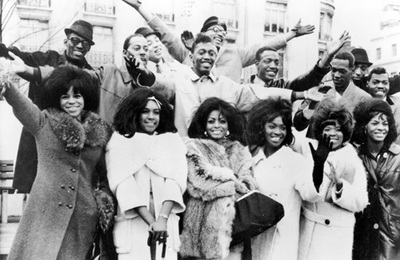 Not only did it influence the style of American pop music and performance, Motown also impacted the culture of the American society as a whole. Before Motown, it would have been practically impossible for a black artist to get airtime on national radio. A few years before Gordy founded Motown, Elvis Presley, one of the most influential musicians in rock 'n' roll history, was denied airplay for some radio stations because he "sounded black" (32). 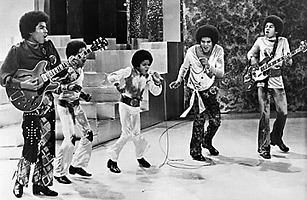 However, Motown would soon make a way for minorities to succeed in the world of popular music and culture. Because of Gordy's standard for high quality, he allowed for his music to appeal to a wider audience, extending to the whole nation. 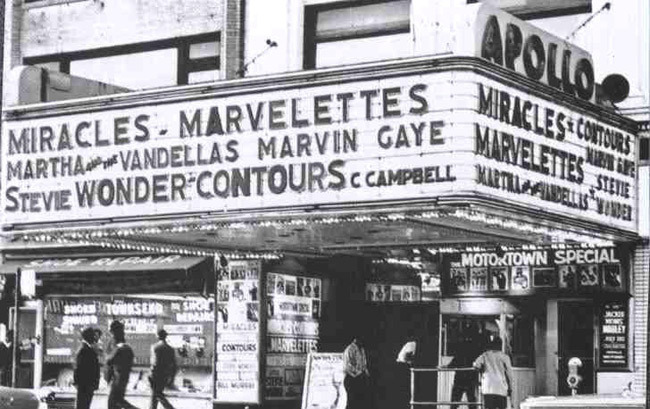 In the 1960's, Motown was the nation's largest black owned company (33). As a result, Motown Records achieved great accomplishments and many firsts for black artists and musicians. Gordy was able to book some of his artists to play live on popular TV shows like American Bandstand and the Ed Sullivan show, shows which catered to white audiences and typically only had white people appear on their show up until the Motown era (34). This not only allowed for Motown Records to gain publicity throughout the nation, but it also opened doors for other black artists to be more widely accepted. Also, the Supremes were the first R&B act to perform live in NY Copacabana, a prestigious night club in New York City, again showing Motown's impact on popular American society (35). 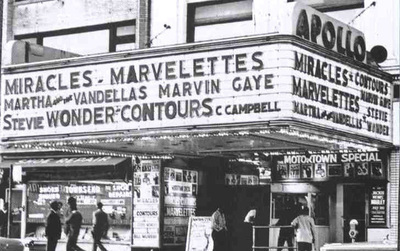 "The Marquee of the Apollo Theatre." Newyork.com. N.p., n.d. Web. 13 May 2015. <http://www.newyork.com/articles/attractions/on-view-the-motown-sound-at-the-schomburg-center-for-research-in-black-culture-94170/>. 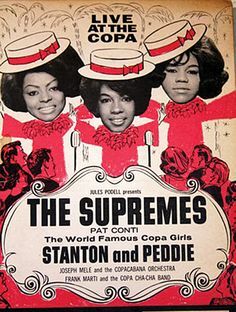 Supremes Poster. Pinterest.com. N.p., n.d. Web. 13 May 2015. <https://s-media-cache-ak0.pinimg.com/236x/93/d6/57/93d657ee163deb5af2f34fc87b4fd4a6.jpg>. 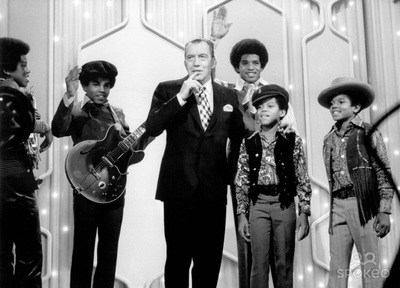 "Ed Sullivan with the Jackson Five." Spokeo.com. N.p., n.d. Web. 13 May 2015. <http://www.spokeo.com/Diana+Ross+1/Sep+18+1970+Other+Photos>. 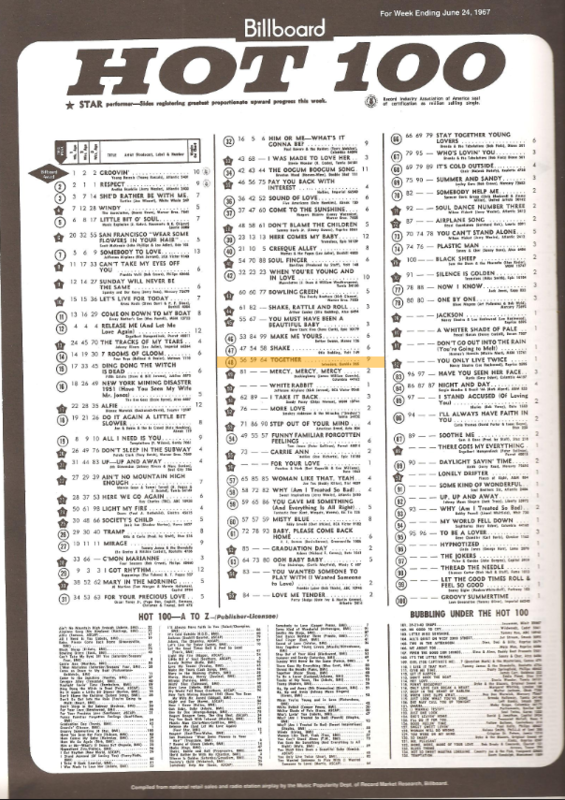 Billboard Hot 100. Blogspot.com. N.p., n.d. Web. 13 May 2015.
the radio, they were now not only being played on the radio, but also rising to the top of the charts. "Berry Gordy & Stevie Wonder Having a Listening Session." Tumblr.com. N.p., n.d. Web. 13 May 2015. .
"The Supremes: Detroit's Own Dreamgirls." Detnews.com. N.p., n.d. Web. 13 May 2015. <http://forums.detnews.com/pix/photogalleries/newsgallery/supremes_01192007/index19.htm>.